Just wanted to let everyone know that Andrew had his surgery a few weeks ago and is doing great! No huge improvements yet but there have been some small things that speak volumes about what the treatment has done for his blood flow. Both of the major veins in Andrews neck were 70% restricted compared to a normal vein, he had a 30% restriction in veins from his heart and kidneys and a 50% restriction in his hip. I spoke with Andrew at a friends BBQ and he told me that his hands were numb still, but a different kind of numb that was hard to explain. His feet were warm for the first time in years and standing up seemed more stable than it had before the surgery. Now is when the hard work begins, physiotherapy and swimming to build his muscles. I’ll keep you posted on his progress. Andrew’s family are so grateful for everyone who supported Andrew, this wouldn’t have happened without you, Behind Sapphire, Bodhi Jones, Nadia Von Hahn, Sweetheart, Carmen Cruz, Goldie Hoffman, Ruven and all the comedians, The Red Room. 100.5 The Peak and YOU GUYS!! Biercraft Bistro is a brutally unfair tease when you go there for lunch and you have a job that, when performed under the influence, could potentially result in death. They have a fantastic craft beer menu including my personal favorite, Deschutes Black Butte Porter. Sadness of no beer aside, I dove into the tapas menu at the Cambie location and decided on the Fish Tacos with a side of Belgian Frites. The tacos were good, citrus marinated white fish (Pollock perhaps?) with cabbage, salsa and chimichurri on corn tortillas. Very messy but really good. Chimichurri is the best condiment in the world, this is a fact. The fish taco is a dish that people have a strange response to until you’ve tried one, do it soon or we can’t be friends anymore. 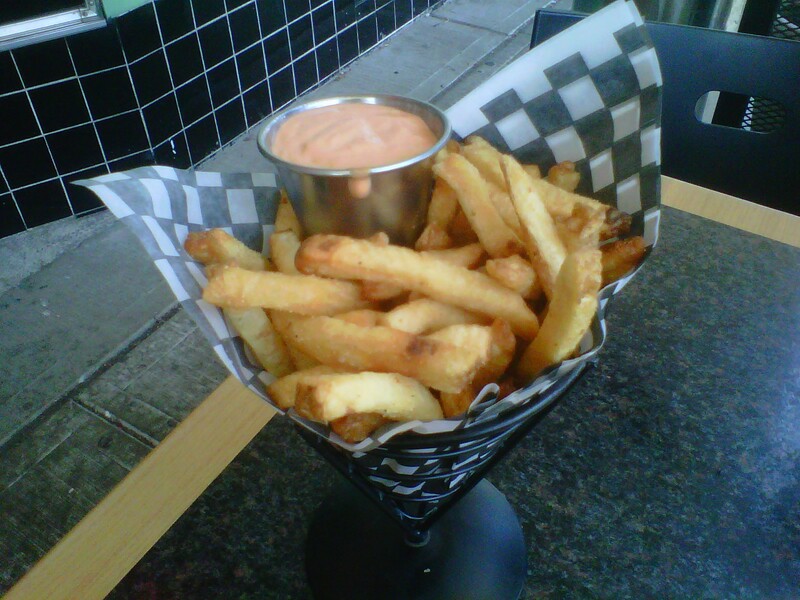 The frites were good too, double fried with a side of chipottle aioli. There were a few that were a little too crunchy but overall they were nicely done. I must go for another visit and plan to take the train home, the beer list is simply too good not to. Over 120 Belgian and Craft beers? Now you’re speaking my language! When ever I am able to I will always choose street food over fast food for lunch. 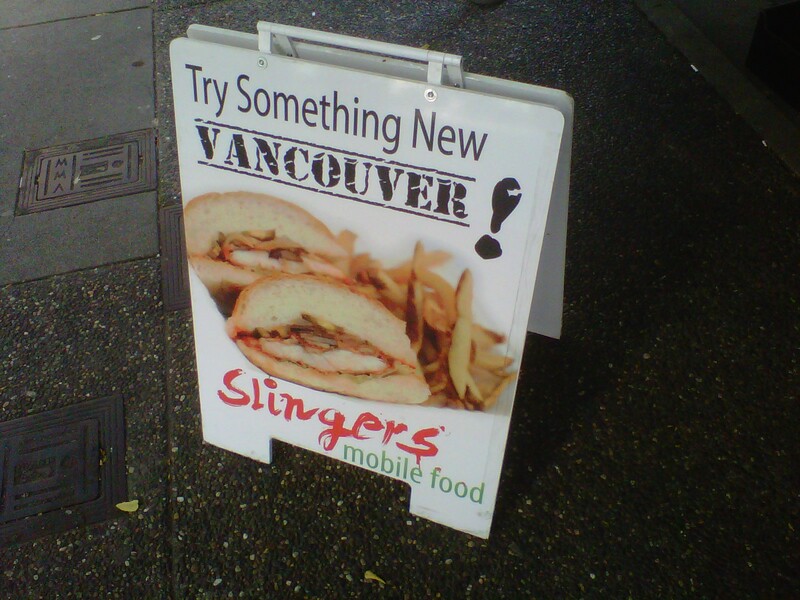 My most recent street food lunch was at Slingers Mobile located on Burrard street in the heart of Vancouver’s Business district. They offer comfort food in it’s purest form. Case in point the Veal Parmesan Sandwich and hand cut fries I sampled. The Veal (please don’t send me nasty comments about Veal, if you don’t want to eat it that’s your choice) was a full breaded cutlet that was cut in two making it a double. There was cheese, marinara sauce, peppers, onions and mushrooms all served on a fresh bun. This is a very messy sandwich so if you’re a suit and tie person be warned. 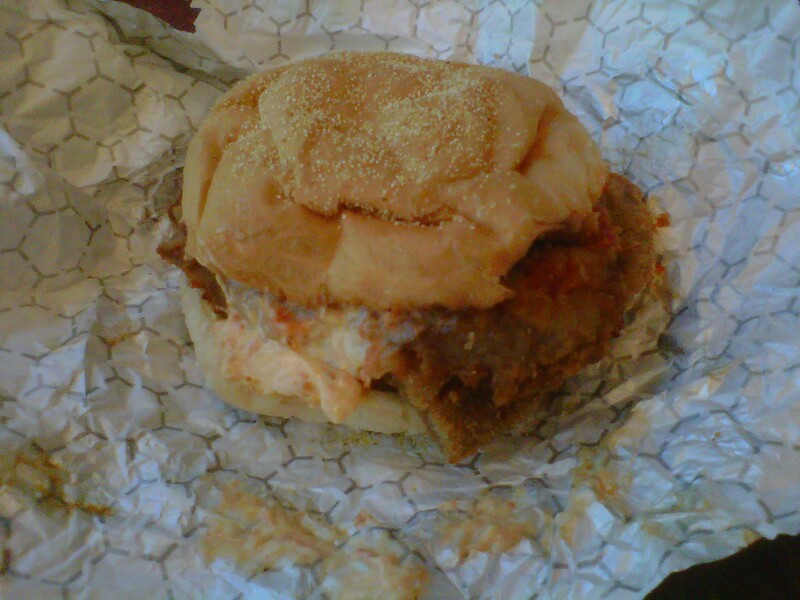 Over all it was a tasty sandwich but the breading on the Veal was a little soggy. It’s also a very filling, rich sandwich, the fries I ordered were too much to finish after eating the sandwich. 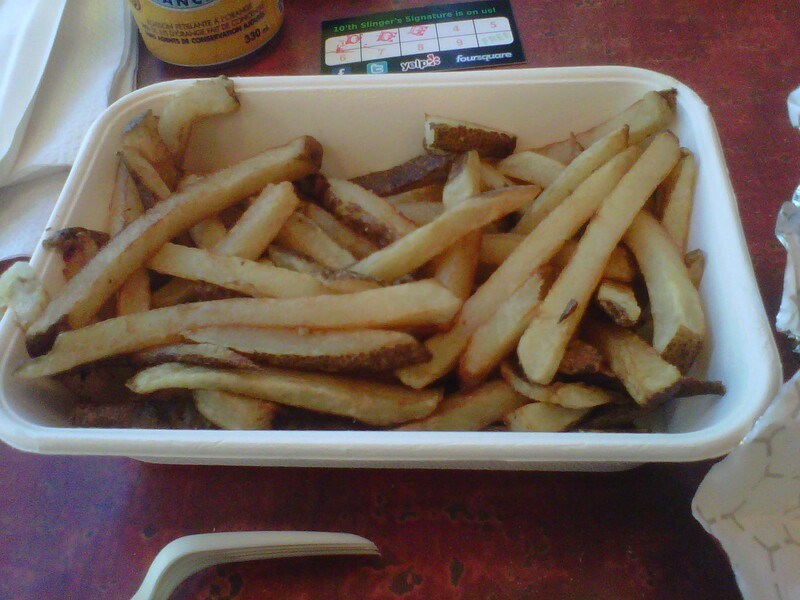 The fries were a letdown, soggy and lacking any seasoning. Fries from a food truck have yet to impress me. Slingers does get bonus points for having “The Dude” displayed on their truck. 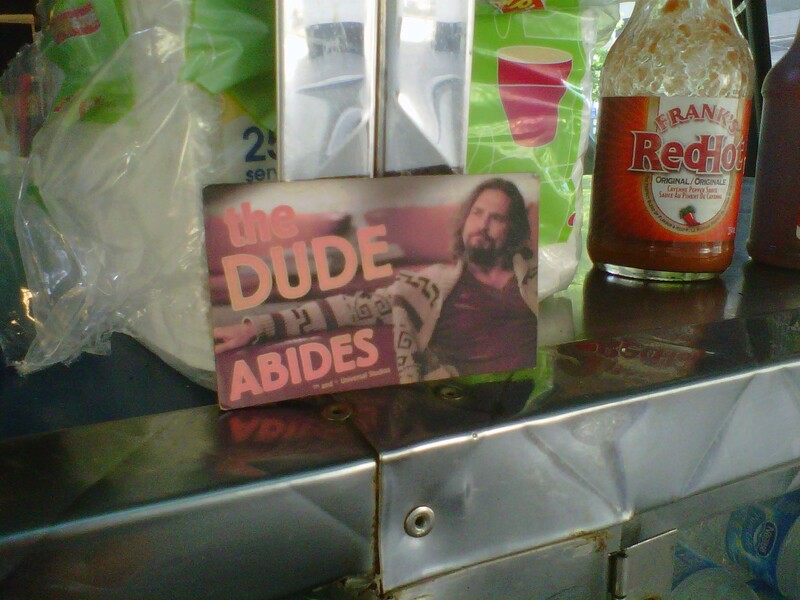 Any friend of The Dude is a friend of mine. As is the case with every other food truck I have visited in this city the staff were great and the truck itself looks amazing. 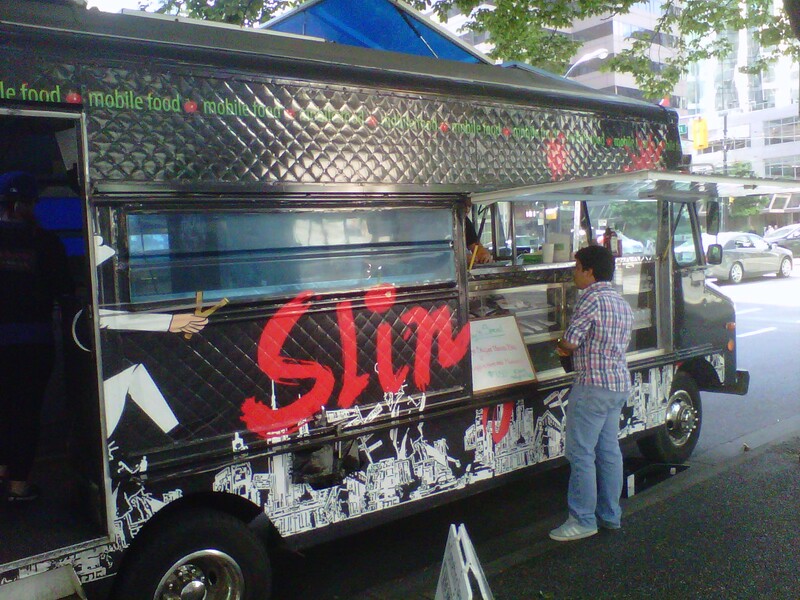 On to the next food truck!! Zen, the latest edition to Adera‘s Salus Community is another example of the great things happening in Surrey. Located at Scott Road and 66th Avenue the Salus Community is an award winning development featuring 18 townhouse buildings, 2 multi level buildings featuring luxury flats and an incredible amenities building featuring an outdoor salt water lap pool and hot tub, an infrared sauna, an amazing and very well equipped gym, onsite spa and wellness facilities and a lounge with a pool table, full kitchen, flatscreen TV and a 3500 square foot rooftop patio with a BBQ and outdoor fireplace. The entire Salus community is Certified BuiltGreen Gold by BuiltGreen BC. They have been built for energy efficiency and sustainability to save the homeowner money on energy costs and lower water consumption. The Zen building features multiple floorplans ranging from 635 square foot 1 bedroom plus den units up to 3 bedroom 2 bathroom units that are up to 1086 square feet. Some top floor units also feature amazing rooftop patios and there is a limited number of townhouse that also offer rooftop patios. The fixtures, cabinets, and fit and finish of these units is top notch which is something Adera, a company started in Greater Vancouver over 40 years ago, is know for. Prices at Zen range from $253900 – $349900. One small disclaimer, SurreyIsTheBomb.com is not sponsored or has not financially benefited in any way from writing about the Salus Community, Zen or Adera, we just really like it and want you to go check it out so have a look through the pictures, check out Adera’s website and maybe even go check them out for yourself! You’d better hurry though, Zen is 70% SOLD OUT!!! Every once and a while being a food blogger has some pretty sweet perks. Late last week I received a lovely gift basket from Take Five Cafe filled with tasty treats from their menu just in time to spread the word about their re-branding and expansion. Take Five is owned and operated by the Punzo family, former owners of Caffe De Medici, a personal favorite of mine that closed a few years ago. It was actually the first real restaurant I ever took a girl to on a date. I had a chance to sample a few items including the Italians Only sandwich, some Chorizo Farfalle and a cheese scone while my wife had Chicken Pesto Penne and a chicken fajita wrap with mango. Everything was tasty but the standout for me was the cheese scone, heated up it was delicious. The pasta dishes lacked a little something which I suspect was salt but lets be honest, we don’t need more salt. The sandwich was very good, Italian ham, Genoa salami, roasted red peppers, provolone, mixed greens and sundried tomato mayo, yum. We also received a bag of their medium roast coffee beans which made a perfect cup from my french press. Check them out if you’re in search of a new coffee spot! Craft beer, really good craft beer, has been the sole property of the Pacific coast of the good old USA for a few years now. Enough hops to punch you in the face from the inside, Porters darker than night time at Mount St. Helens and every other bizarre infusion your could imagine have become commonplace in Washington. Oregon and Northern California. Canada has been left in the dust by a nation known for Bud Light and spray cheese. Russel Brewing Company, located in Surrey, has posted a serious challenge to the supremacy of the Pacific North West of America with its Brewmaster Series. The only issue with these wonderfully crafted bottles and kegs filled with liquid gold is that they are limited quantity. From the Blood Alley ESB to the Black Death Porter every beer in this series is outstanding. My personal favorite is the Guuud! Ale designed specifically Kitanoya-Guu Izakaya restaurants as a palate cleanser. Like I said these beers are limited quantity releases and are available at select private liquor stores including Central City in Surrey and Legacy Liquor Store in the athletes village. Get them before they’re gone, or contact Russell and demand they be put into full production!!! Once a heavily wooded area known for its homeless population and open drug use, Holland Park has been transformed into a beautiful open space where families gather to watch movies on warm summer evenings. Featuring water gardens, pathways and a cafe run by the local Kla-how-eya Aboriginal Centre, Holland Park is another reason Surrey is where the future lives.